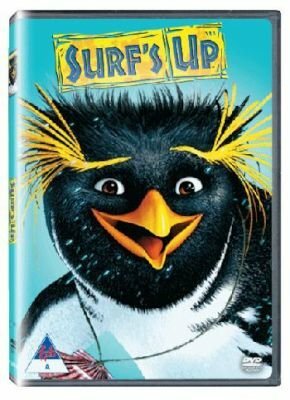 Surf's Up is a computer-animated sports mockumentary about penguin surfing contests, which makes it stand out from the crowd of penguin movies. The story unfolds as it would on any sports-channel on TV, with interviews (with penguins) overlapping footage of (penguin) surfing action, gradually unveiling the tale of Cody Maverick (voiced by Shia LaBeouf, Transformers), a young penguin from Antarctica with dreams of winning a surfing competition--a competition named after his idol, the missing Big Z (Jeff Bridges, The Big Lebowski). But when he joins the competition, Cody finds his zeal for winning may not be enough to defeat the cruel reigning champ, Tank Evans (Diedrich Bader, Grim & Evil).